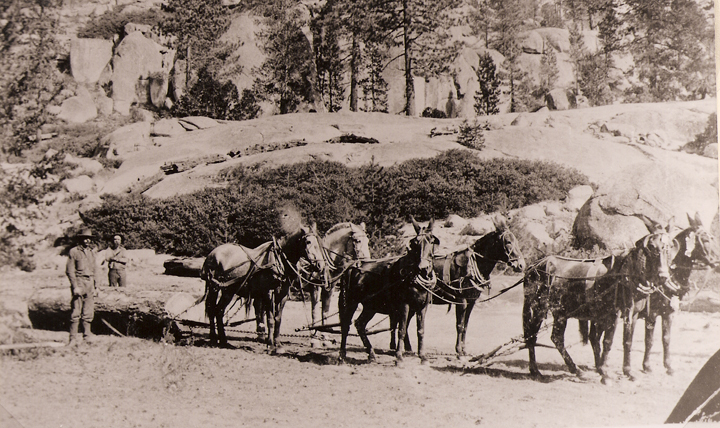 Much of what follows comes from the work of historian, David Davis, done while he was an employee of the Stanislaus National Forest. We use this material with the consent of the USFS. Recently (2013) David has completed a very comprehensive history of the Raggio Mill, which is available, we believe, through the County Archives. 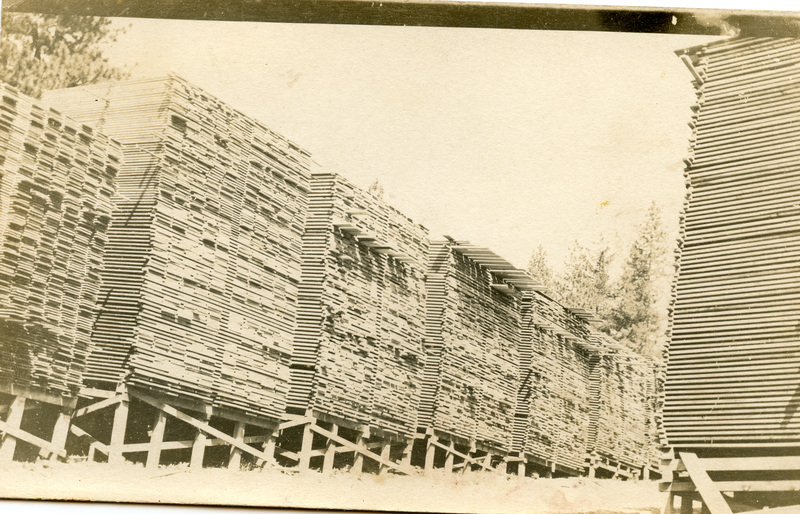 An abundance of documentation exists on the Raggio family and the two Raggio sawmills, first one built on San Domingo Creek and then moved to Cowell Creek, in Calaveras County during the first quarter of the twentieth century. The first mill was operating by 1906 on San Domingo Creek. 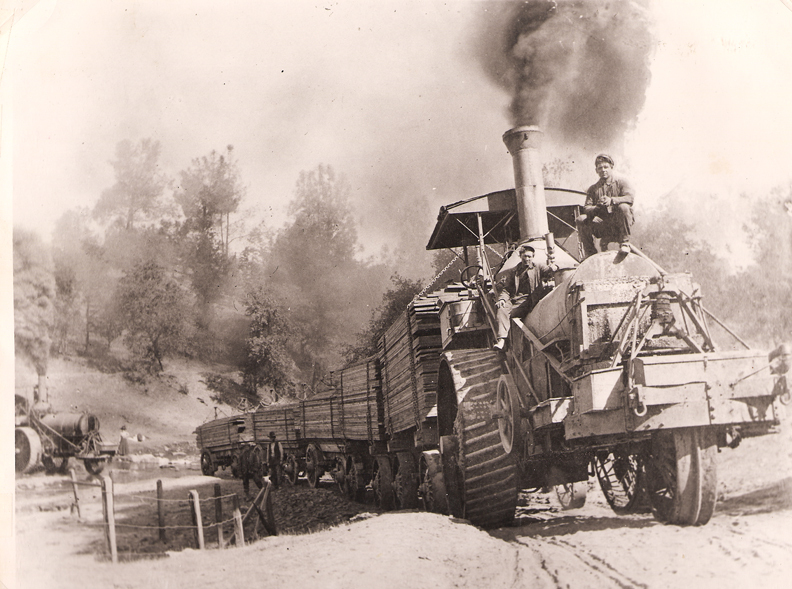 After the timber in that vicinity was harvested, the entire mill was moved to Cowell Creek, less than two miles away. 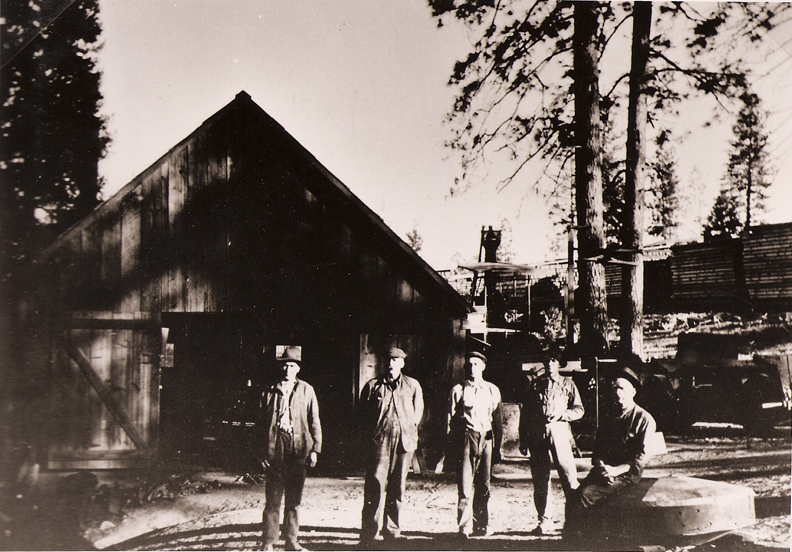 The Cowell Creek mill operated until 1924, until it, too, had harvested all the surrounding timber that belonged to the Raggio brothers. 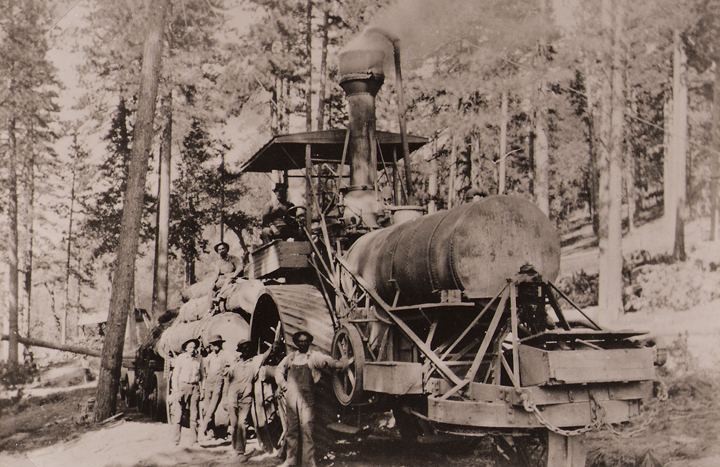 After that the mill machinery was purchased by the Manuel family partnership, and was moved north to San Antonio Creek, not far from White Pines, where it produced lumber until the early 1950s. 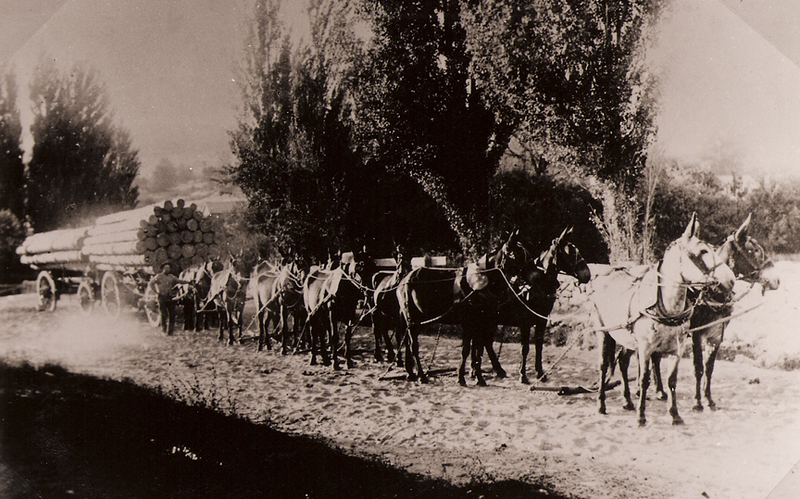 Mules again, but this time the logs are on wagons, presumably because there is now a road of sorts. The first of the Raggios emigrated in 1854 from Northern Italy to California in search of gold, arriving first in Amador County with one newly born child, Joe. Richard, Lester’s father (and later the Cowell Creek Mill’s logger and part owner of both Raggio mills) was born in Jackson (Amador County). Four more boys were soon to follow, each as bright and ambitious as his brothers. 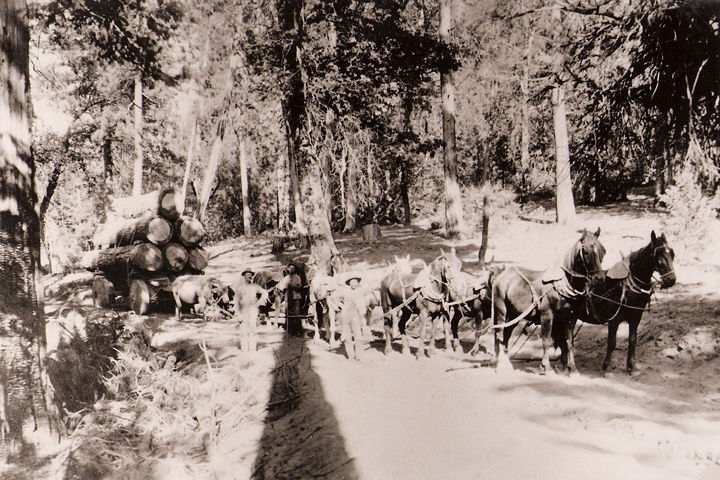 In 1905, following a large number of small land acquisitions purchased for timber-cutting, the first Raggio sawmill was built on San Domingo Creek, approximately a mile west of today’s Red Apple on Highway 4. Its power source was steam. 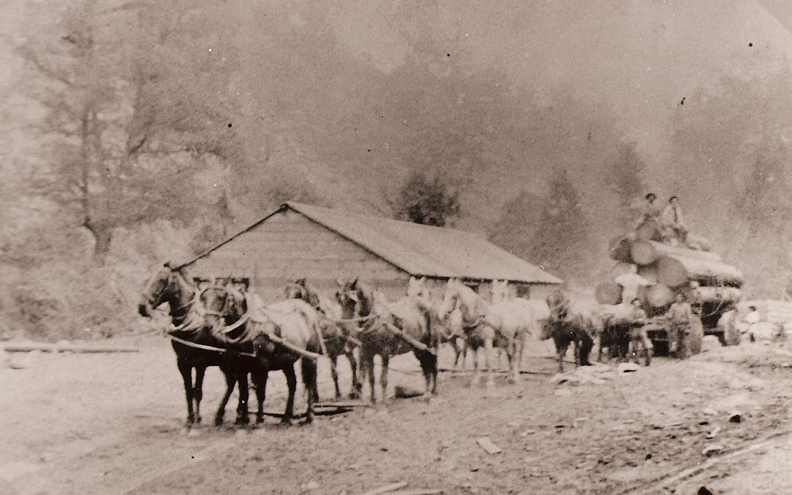 By 1906 the mill was operating and other structures had been erected to service the mill, mill hands, and loggers: namely, several small houses or cabins, two bunkhouses, a blacksmith shop and apparently enough barns and sheds to take care of six mule teams and a number of horses. 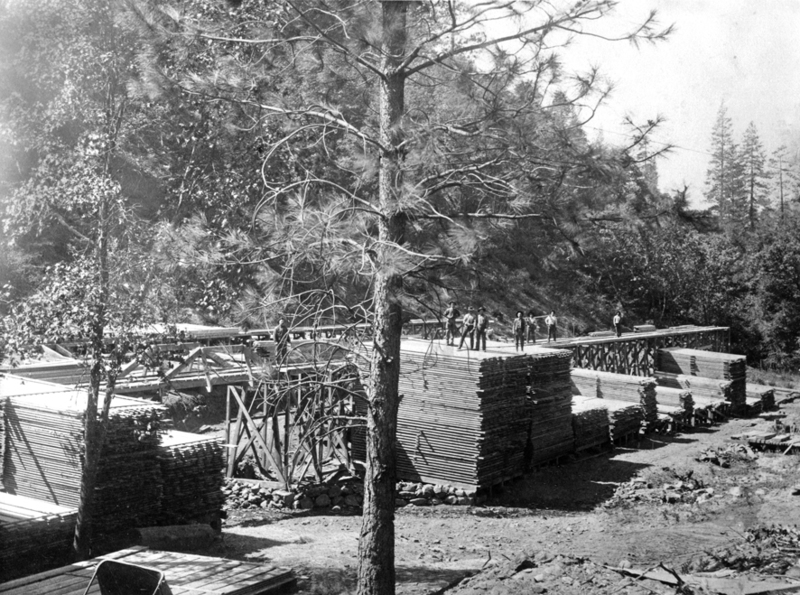 Lumber of all kinds was in great demand, not only for buildings in Murphys and Angels Camp, but for flumes and the shoring up of mine shafts. The Ragios catered to certain mining companies with direct deliveries for several years. Raggio Camp 3 miles above Murphys on San Domingo Creek. Joe and Lester Raggio in photo. 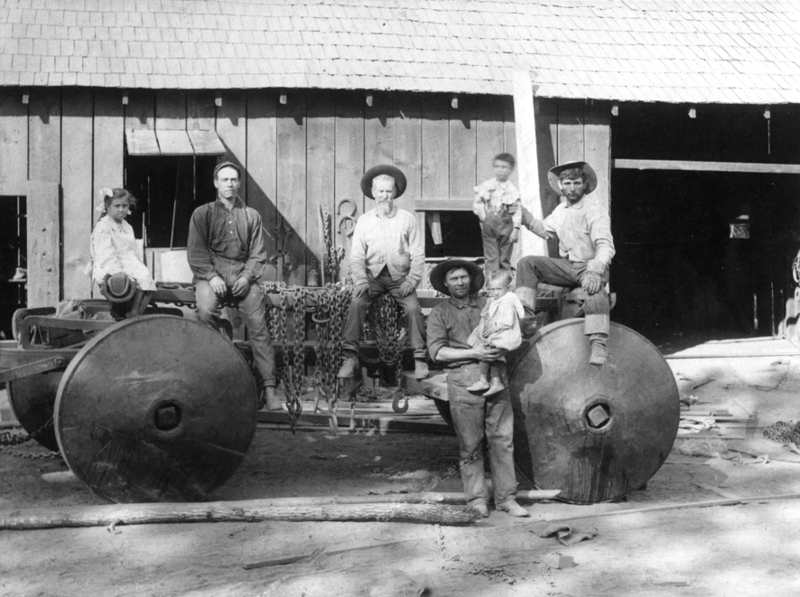 The San Domingo Creek Mill continued operation until 1910, when it was moved to Cowell Creek. 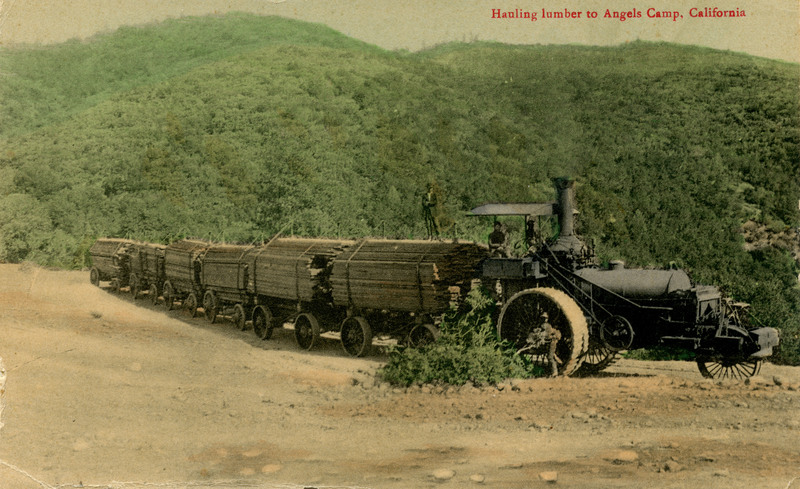 In the same year, the Raggios ceased hauling rough timbers to the mines in Angels Camp, milled lumber now becoming their primary product. 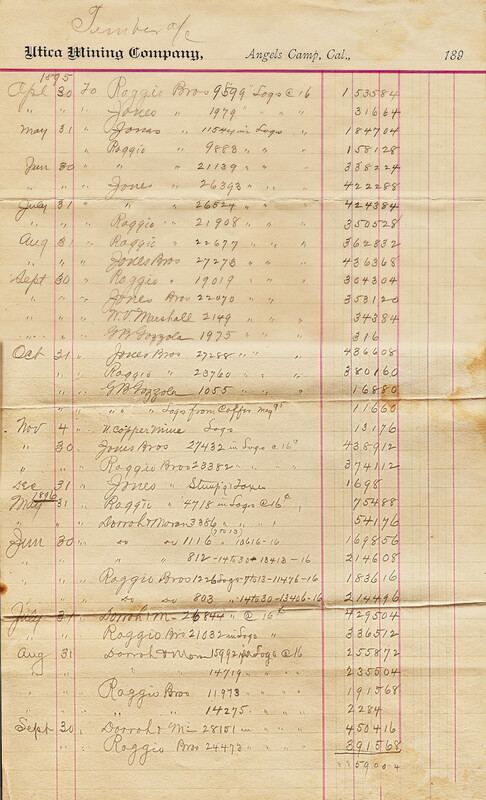 The invoice below will show that while they were furnishing timber to the Utica Mine, a lot of money changed hands. Earlier in this history, David says that the mill opened in 1905, but these billheads show that the Raggios were delivering large shipments at least as early as 1895. Clicking on the above will give you a very clear image showing that the Utica Mine was paying a number of sources for timber, including the Raggio Brothers. If you look closely at the above photo you’ll see another steam traction engine following behind the first. Both are similar to Ol’Beth, that now stands in front of the Angels Camp Museum. The Cowell Creek Mill may be seen as a fairly typical mill of its type, neither small nor large, generally producing about 30,000 board feet of lumber per day. What may be considered a little unusual is that it was built in an unusually restricted space on a very steep hillside that drops precipitously into the rock-strewn gorge containing Cowell Creek. Because of this location, it was necessary to gouge out the hillside to a depth of more than a dozen feet in places, and to construct of the dam built to hold back the millpond, upstream from the mill. A large drying yard was located on a sunny slope slightly uphill from the milling operations. 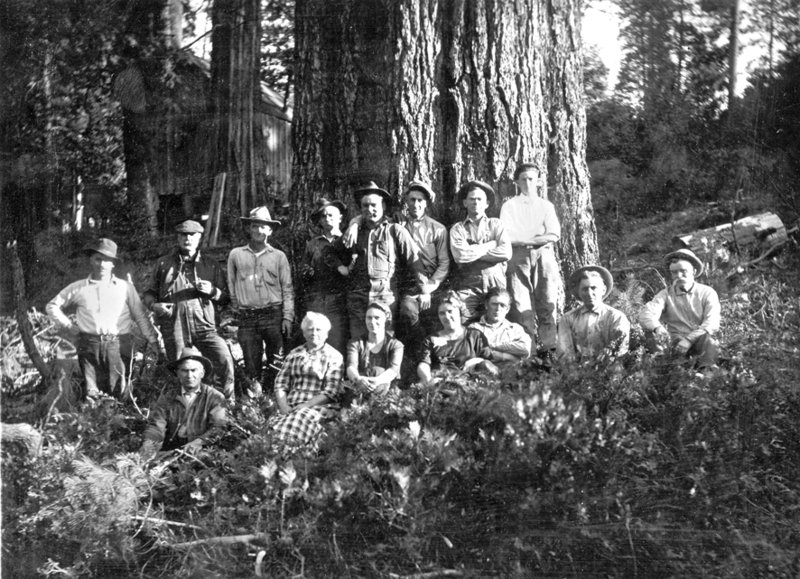 Over a period of less than 15 years the Cowell Creek Mill cut the remaining large sugar pines and other trees not previously harvested (including those in the logging camp itself) and sold the mill to the logging and milling division of Manuel Estates. Richard Raggio, who ran the Cowell Creek operation, retired at the age of 63. Ernest Raggio Sr., who presided part of the time over the mill and part of the time over the office and lumberyard, reached his 66th year before retiring. 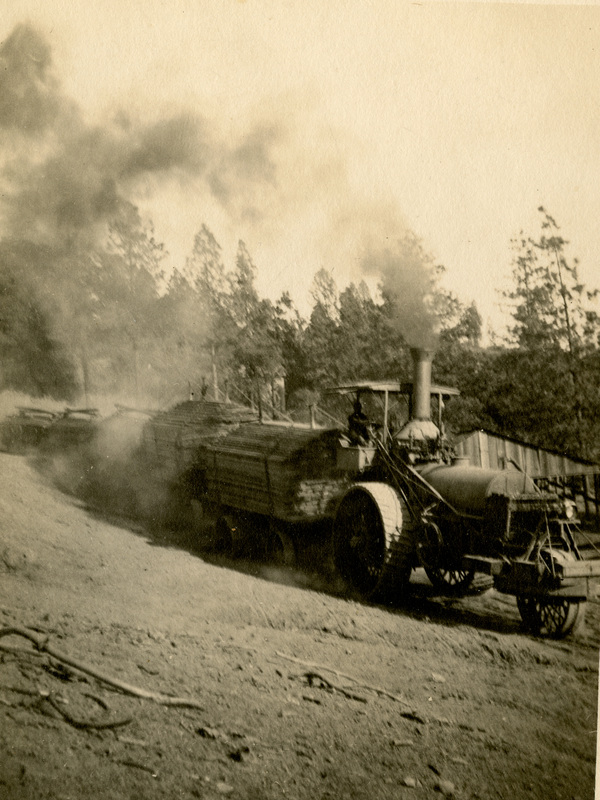 Some photos courtesy of Calaveras County Historical Society, some from archivist Judith Marvin, others from the Raggio family.